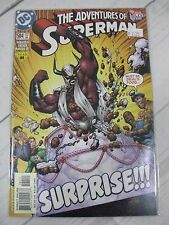 SUPERMAN ADVENTURES #5 FIRST APPEARANCE OF LIVEWIRE KEY ISSUE! ADVENTURES OF SUPERMAN (1987) # 584, 585, 586, 587, 588, 589 "RETURN TO KRYPTON"
the Adventures of Superman 637 (DC, Apr. 2005) Superman. Intact.